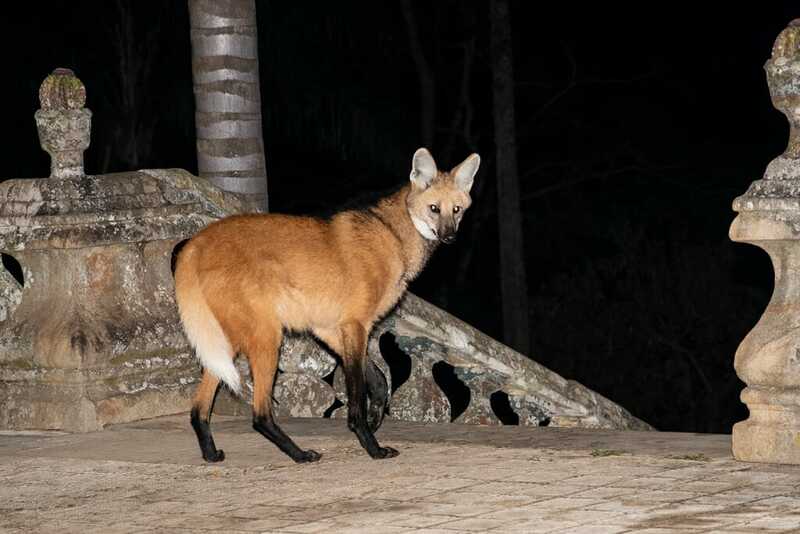 After seeing the astonishing amount of wildlife in the Northern and Southern Pantanal, we still had one unique animal on our wishlist – the Maned wolf. Despite its large size, the Maned wolf is a shy and secretive animal that is incredibly difficult to see in the wild. 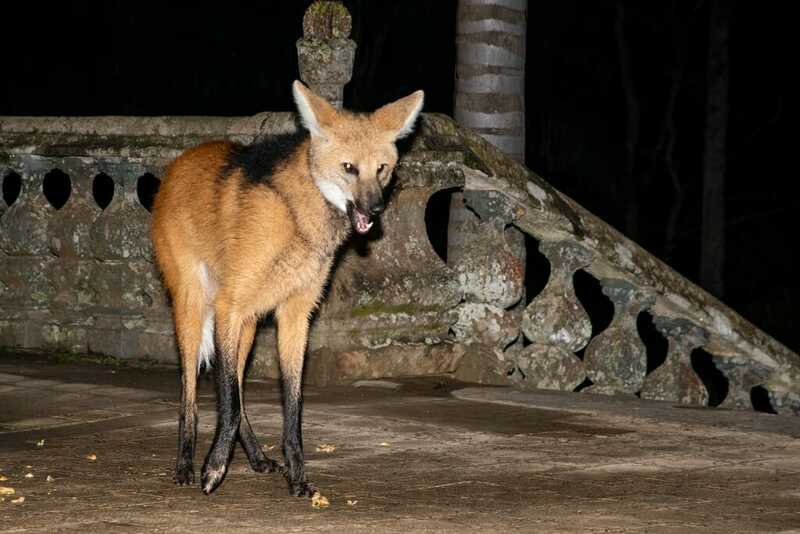 Thankfully there is one spot in Brazil that a pair of wild Maned wolves visits most nights. 2.3 Is it an ethical experience? Caraca Sanctuary or Santuario do Caraça in Portuguese, is an unusual destination. It is as much a place of spiritual pilgrimage as it is a nature sanctuary. 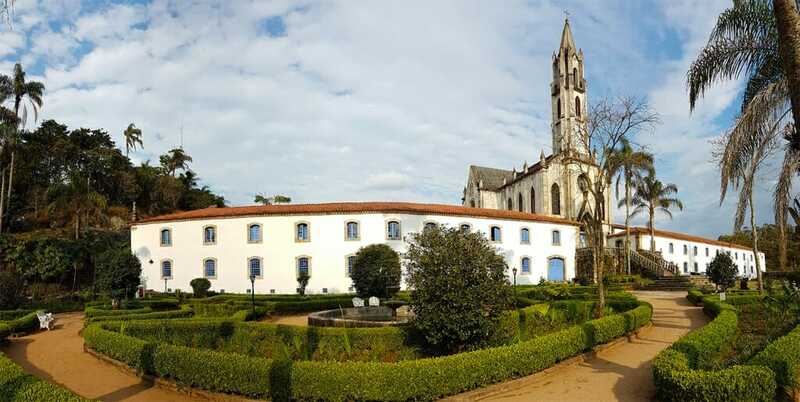 Established in 1774 by a Portuguese monk Brother Lourenço, Caraça has been later converted into a seminary that served as an important Catholic educational institution for 148 years, until the school burned down in 1968. The repairs to the school building were deemed too expensive, and the authorities decided to preserve the site as a place of cultural heritage and religious pilgrimage. 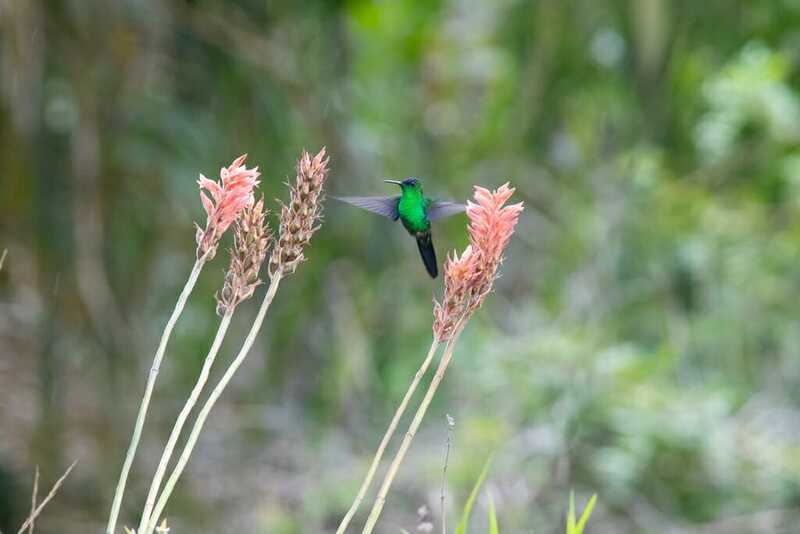 Today, the sanctuary is jointly managed by various agencies including the Catholic Institution, Natural Heritage Private Reserve, and Brazilian Cultural Heritage. There is something for everyone at Caraca. The architectural complex at Caraca consists of a neo-Gothic church bookended by the side wings of a two-story Baroque-style building that houses the living quarters, the two dining halls and various other facilities. The ruins of the old college are now a museum that you can visit on request. 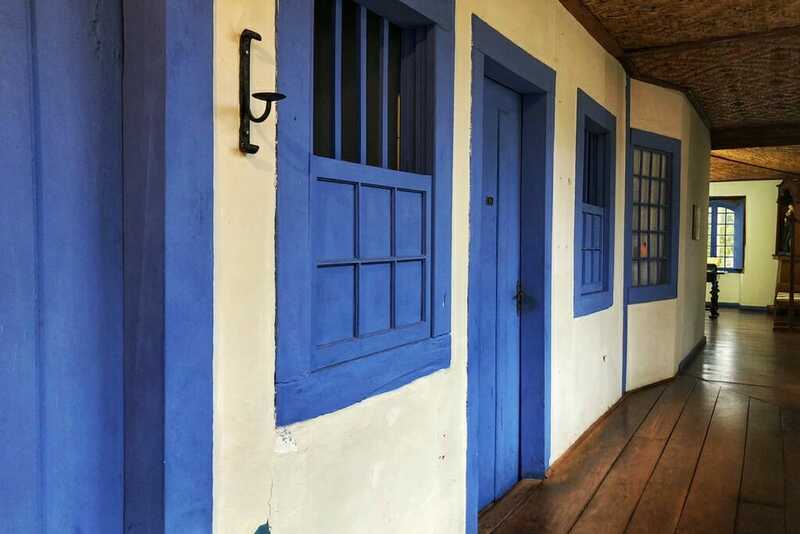 Nestled inside the 11,233-hectare nature sanctuary, at 1729 meters above the sea level, Caraca is surrounded by the forest-covered mountains of Serra do Espinhaço mountain range. 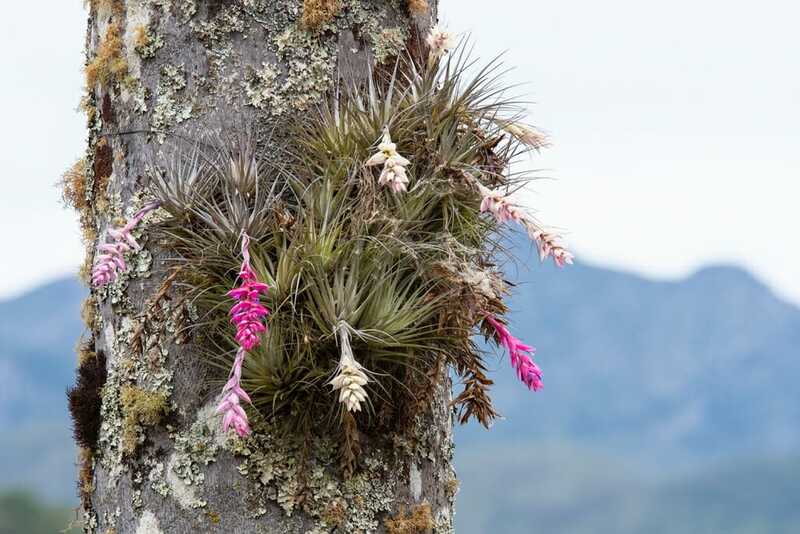 It lies at the meeting point of two biomes – the Atlantic rainforest and the Cerrado or grassland, which means it is home to a unique mix of wildlife species from both habitat types. 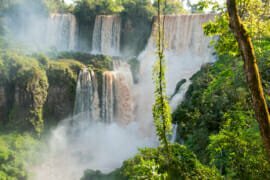 The sanctuary is located between the towns of Catas Altas and Santa Barbara in the state of Minas Gerais in southeastern Brazil. The closest airport to Caraça is Tancredo Neves (formerly Confins) International airport in Belo Horizonte. 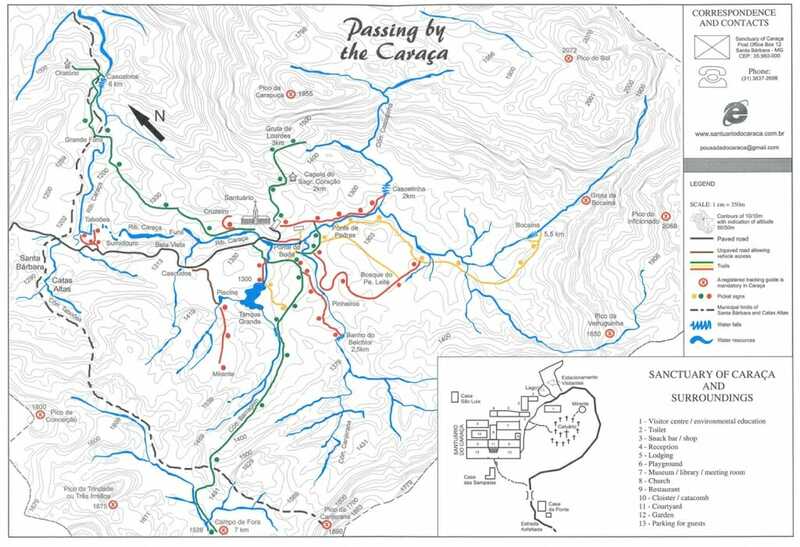 From here the best way of getting to Santuario do Caraca is by car – there are plenty of car rental agencies at the airport. We went with Alamo and were very happy with our little Fiat Uno. Tip: Book the car online as far in advance as you can. The prices for booking on the spot can be significantly higher. We followed Google Maps directions to the sanctuary (Estr. do Caraça, Minas Gerais, Brazil) that took us along MG-010 from the airport until joining BR 381 heading for Barão de Cocais. Sabor de Minas Pousada in Barão de Cocais is a convenient spot for lunch. It has the usual Brazilian fare on offer, and a plate full of meat, vegetables, rice or black beans plus a soft drink will set you back only BR $12. From Barão de Cocais we followed MG 436 that took us to the Santuario do Caraca turn off, just outside of Santa Barbara. The 120-km drive took almost 3 hours due to some roadworks on the narrow, twisting mountain roads. 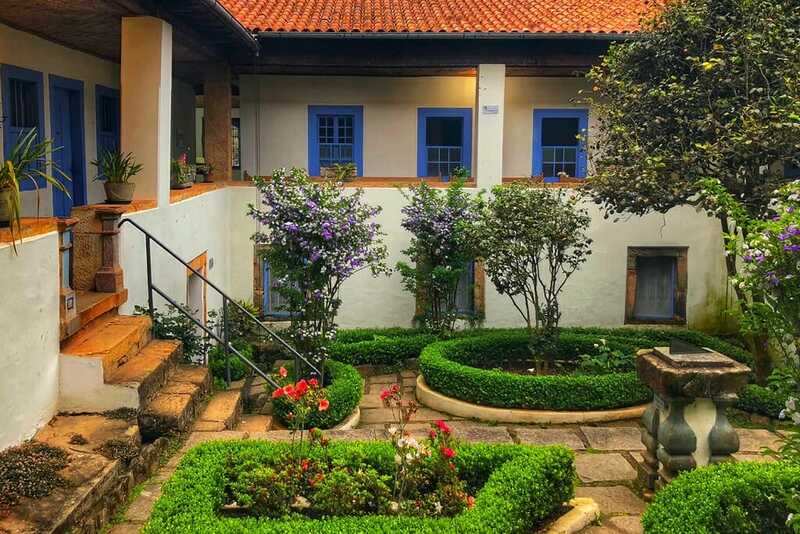 Part of the architectural complex, Caraça Inn is the main accommodation option. The rooms are basic but cozy. Prices start at BR $318 for a single person and BR $212 per person for two people sharing. Set apart from the main complex, are the 4-people cottage and the 12-people house. Both buildings are about a 10-minute walk away from the church. 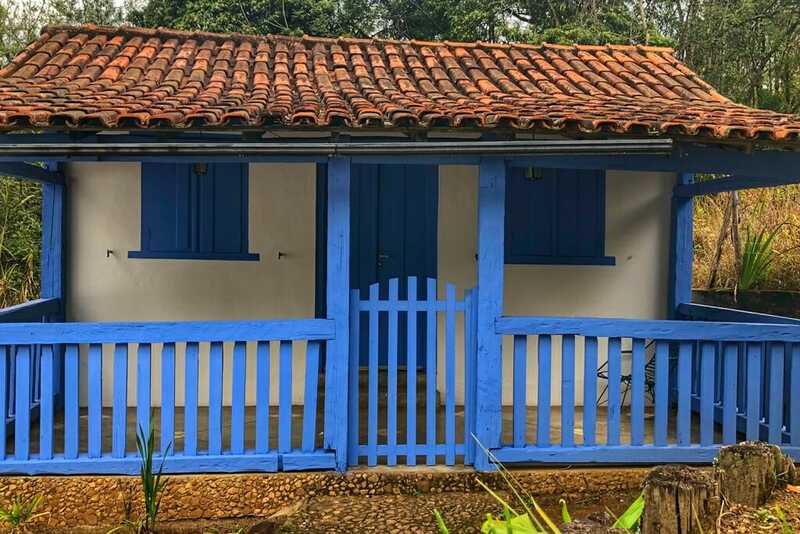 The prices for the house and the cottage start at BR $165 per person for 2 or more people sharing. We stayed at the cottage and loved the privacy of it. It was comfortable for three people, but it would get a little too cozy for four adults. A word of warning – there is no hot water at any of the buildings so if you are planning on taking showers, plant to have them in the middle of the day when it’s warmer. There are two dining halls at Caraça, one for breakfast and one for lunch and dinner. Breakfast at Caraça is served in a traditional way where you fry your own eggs over a wood-burning stove. 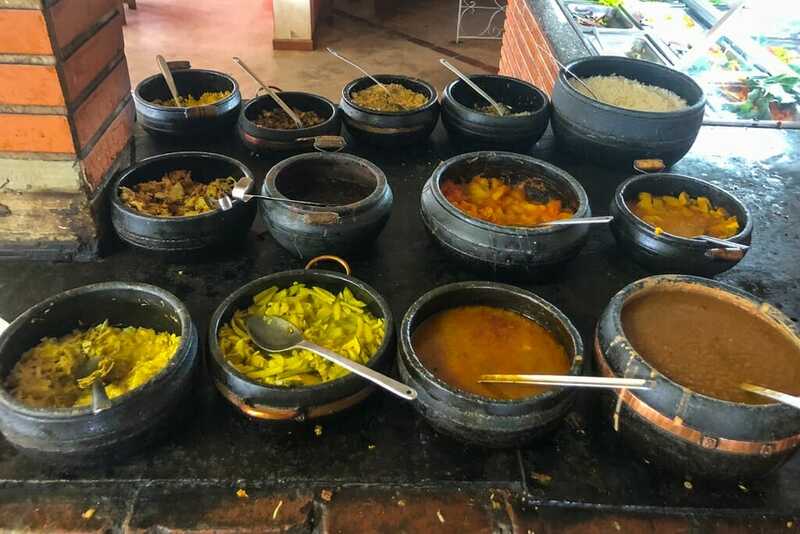 Lunch and dinner are served in the typical Brazilian buffet style with plenty of meat, fish, vegetable, rice and black beans options available. There is also a cafeteria next to the reception where you can buy coffee and snacks, and some souvenirs at the adjacent gift shop. 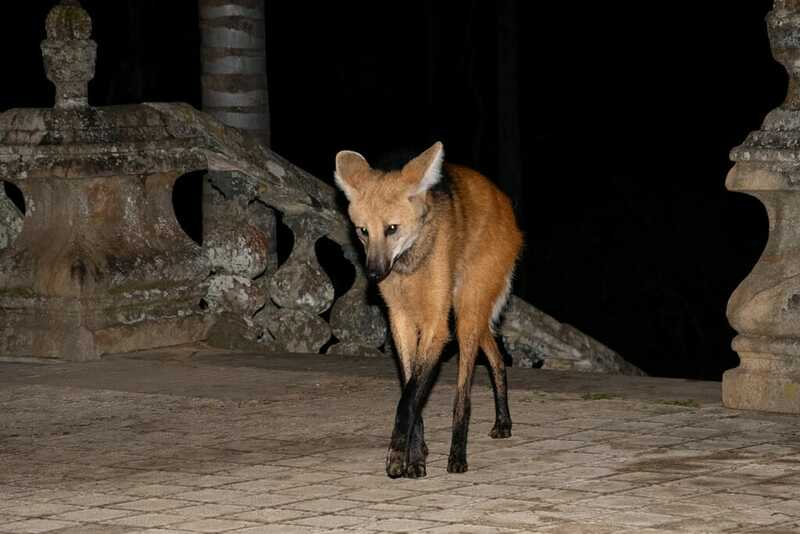 At the moment, two Maned wolves visit the churchyard at Caraça, a male and a female. 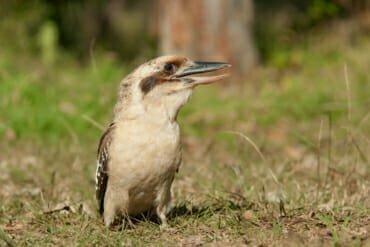 They are the resident breeding pair in the area. The Maned wolves mostly live solitary lives, but they stay together during the breeding period and while raising their young. There are images on Caraça’s website of the female and her three cubs in the portico of the church. So at the very least, the feeding sessions by the monks contribute to raising the next generation of Maned wolves. The tradition of feeding the wolves began in 1982. Father Tobias, the head priest at the time, noticed that the church’s trash cans were frequently tipped and raided during the night. Curious to find the culprit, he stayed up one night and to his utter amazement discovered that it was a Maned wolf. The high-altitude Cerrado grasslands that surround Caraça are the preferred habitat of these unique canids. But even if the monks didn’t know just how unique the Maned wolf is, its looks alone were enough to endear it to them. To keep their trash cans from being raided, the monks began to leave scraps of meat for the wolf in a tray nearby. Since then many generations of Maned wolves participated in the tradition of dropping in for an evening meal to the church. Today, people staying overnight in Caraça can join the wolf encounter if they are willing to sit still and mostly silent for a few hours after dinner, waiting for the wolves. While it looks like a fox, barks like a dog and walks like a deer, the Maned wolf (Chrysocyon brachyurus) is not closely related to any other animals. It is so unique that it is thought to be the only South American canid that survived the Pleistocene extinction that wiped out most of the megafauna including the sabre-toothed tigers and the woolly mammoths. Not only is it not a wolf, but it also doesn’t have a mane. The hair on the back of its neck is simply very dark, but it’s not any longer than the rest of its fur. So the mane is an optical illusion. However, when feeling threatened, the wolf can erect the hairs on the back of its neck to appear larger and more intimidating. The maned wolf is not very vocal, but the sound it does produce is not a howl, but the deep, guttural sound that the experts call a roar-bark. The primary method of communication between Maned wolves is olfactory – they leave sent signals for each other that happen to smell like marijuana. The scent is so deceiving that it once sent Dutch police searching Rotterdam zoo for the alleged pot smokers who didn’t actually exist. Wolves are known for their strict social structure – they live and run in packs. In contrast, the Maned wolves are solitary animals that come together only to mate. Interestingly, however, the pairs are monogamous. They share the same territory at all times but generally live their lives independently. But during the breeding period, they return to each other. Standing 90 centimetres tall at the shoulder, the Maned wolf is the tallest canid in South America. But despite its impressive size, the Maned wolf is not built for killing large prey. Its jaw and teeth are simply not big enough. Its hunts rodents, small birds and frogs, and up to half of its diet is made up of fruit and vegetables, like bananas and avocados. The Maned wolf faces a number of threats in the wild and consequently listed as “Near Threatened” on the IUCN Red List of Threatened Species. The entire global population numbers around 17,000 mature adults, most of them occurring in Brazil. Suspected of killing chickens, Maned wolves are often killed by poultry farmers across South America. They are also susceptible to diseases spread by domestic dogs. But the main threat for the wolf is the loss of habitat. Over the past decades Brazil suffered one of the highest deforestation rates in the world, and the Maned wolf population declined by at least 20% in the past 15 years. At 8 pm, the staff at the sanctuary set up a free lemon tea and popcorn station for the diligent naturalists. By 9 pm I had two helpings of both. As we sat there waiting, Father Lauro’s monotonous voice carried over from the church as he recounted stories about the wolves in Portuguese. The hardness of the stones I was perched on provided just enough discomfort to prevent me from dozing off. And then a beautiful pointy face with enormous ears appeared over the lip of the portico stairs. Cautiously, the wolf surveyed the dimly-lit veranda and climbed the last few steps. It was amazingly tall and absolutely stunning. Walking gingerly towards its tray, it kept stopping, turning back to the stairs and rotating its satellite dish – like ears as if trying to hear something in the night. When it finally made it to the tray (all of about ten steps), it stopped again and looked around. It was acting so sheepishly that I was afraid it would dart for cover any second. But it didn’t, and eventually, it felt comfortable enough to start gulping meat. Although, it kept walking over to the stairs and listening intently into the night every few minutes. It stayed for about 10 minutes all up until purposefully walking down the stairs and disappearing into the darkness. On our second night, there was a school group from Rio staying at the sanctuary, and about a dozen kids stayed up to wait for the wolf. No matter how well-intentioned they were, the kids were unable to stay still and quiet for longer than 5 minutes at a time. After a couple of hours of waiting, I began to doubt our chances of seeing the wolf again. But at about 7.30 pm the wolf appeared. Even more hesitantly that last night, it approached the meat tray and after grabbing a single mouthful it cowered back down the stairs. We, of course, blamed the kids for their constant chatter and moving about. But we remained on the veranda, hoping that the wolf would come back to finish its food. It did, around 9.40 pm, but from its behaviour, it was obvious that it was a different animal. Still cautious and alert, it seemed much more confident than the earlier visitor. One of the English-speaking staff confirmed our guess – the first wolf was the female. We were lucky enough to see both resident Maned wolves. Is it an ethical experience? Whenever a tourist attraction involves wildlife, you have to ask yourself whether it is an ethical experience or whether wild animals are being exploited for the tourists’ benefit. The first red flag is the offer of any kind of handling of the animals. Generally, try to steer clear from such experiences unless it is a certified facility that adheres to strict animal welfare guidelines. Here is an excellent summary of various certification programs. There is, of course, no handling of the Maned wolves at Caraça. The animals are wild and only partially desensitized to human presence. The wolves have a clear path for retreat, should they feel uneasy, which they do at any sudden movement from the people. This is why the people are instructed to keep still and quiet during the wolves’ visits. Another red flag is baiting of wild animals for tourism. 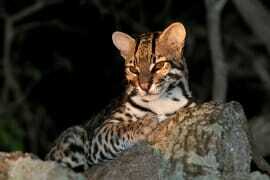 In Brazil, it is becoming increasingly common, with operators like SouthWild offering some experiences where wild animals are habitually bated for people wishing to photograph them. I generally make a point of avoiding such experiences. At Caraça, however, the wolves are not baited for tourists. The sanctuary doesn’t advertise the wolf encounter, aside from providing some general information on its website. The wolf feedings are not a tourist activity. It is a unique relationship between wild animals and Catholic monks sharing a home in a nature sanctuary. The relationship is open for negotiations to both parties. The monks could discontinue the feeding if they feel the experience doesn’t meet their values anymore, and the wolves can choose to stop coming if they no longer feel safe enough. Only a relatively small number of people stay at the sanctuary overnight, and even fewer choose to stay up late waiting for the wolf. So generally there is only about a dozen people gathered when the wolf arrives. The main concerns with feeding wild animals usually include the risk of animals growing to rely on the artificial food source and their habituation to people that could lead to conflicts with people and domestic stock. Caraca’s Maned wolves have been the subject of a number of ecological studies, and their diet was found to be very similar to the wolves’ diet elsewhere in their range. So while the wolves get a free snack at Caraça, they still hunt their natural prey in the wild. As to habituation, Caraca’s Maned wolves are timid animals, and there are no other human settlements within the sanctuary where they could come into contact with people. Personally, I do not feel that the wolves are negatively affected by the feedings at Caraça. In the world where wildlife is continually losing the battle for space to humans, the unique relationships like this raise people’s awareness of what we have to lose if we don’t preserve the remaining wild habitats. While birds can be observed anywhere on the sanctuary grounds, a good birdwatching spot is the forested hill right opposite the church. It is a tranquil place to wander among the 12 stations of the cross and to get picturesque views of Caraça architectural complex. Another productive spot is the small pond at the end of the main access road. 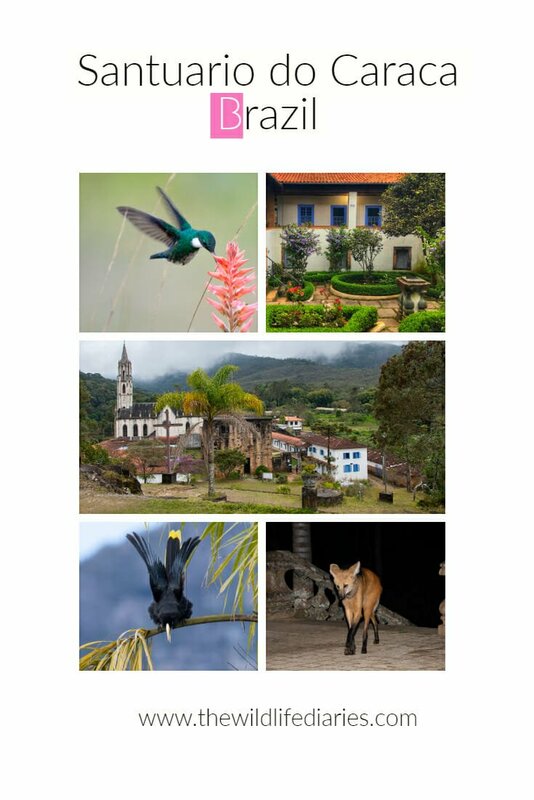 Santuario do Caraca is home to 42 species of mammals, and some of them are not difficult to spot. 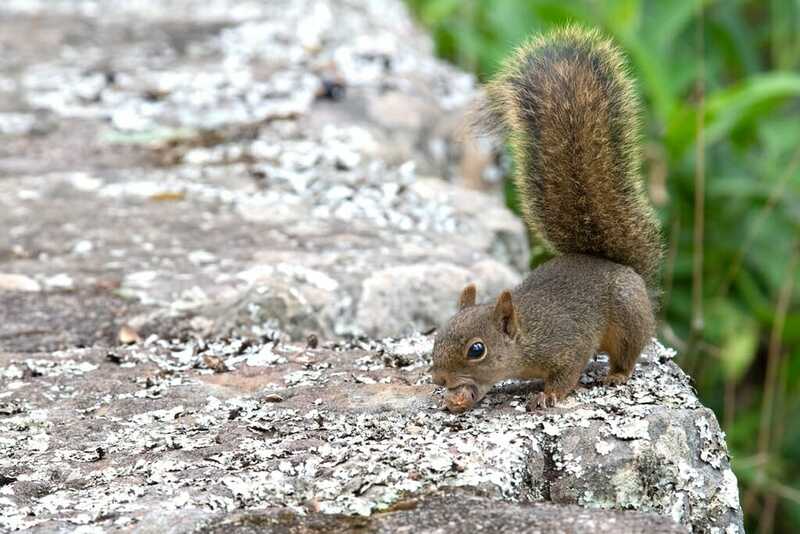 You are quite likely to spot a Brazilian squirrel, for example. They feed in the large trees overhanging the stone fence at the car park. It’s an atmospheric spot to sit in the afternoon watching birds and squirrels go about their day. 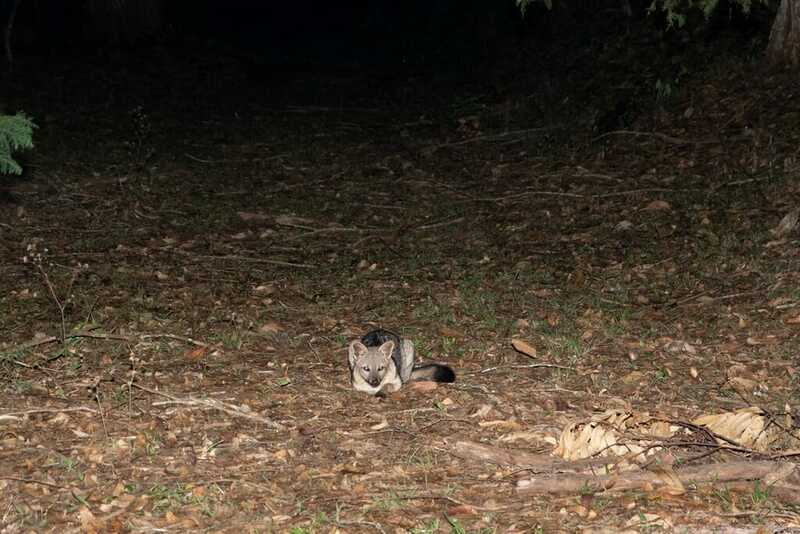 At night, you may come across a Striped hog-nosed skunk either on the sanctuary paths, or it may come in to steal a mouthful from the wolf’s tray. 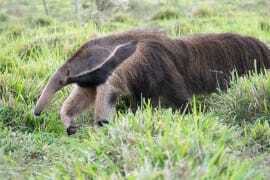 And even if you don’t get to see the animal, chances are you would get a whiff of its scent. The forest, where all the walking trails start (see below) is good for spotting mammals at night. We had to go past it to get to our cottage after the wolf feeding and on the second night, we came across a rather tame Crab-eating Fox. The walking trails in the sanctuary vary from short and generally flat paths to the more challenging hikes to mountain peaks and other waterfalls. The most popular trail is Cascatinha – a 40-meter tall 4-tiered waterfall. It is easily accessible up to the third tier and you are welcome to take a dip in the pools underneath the cascades. 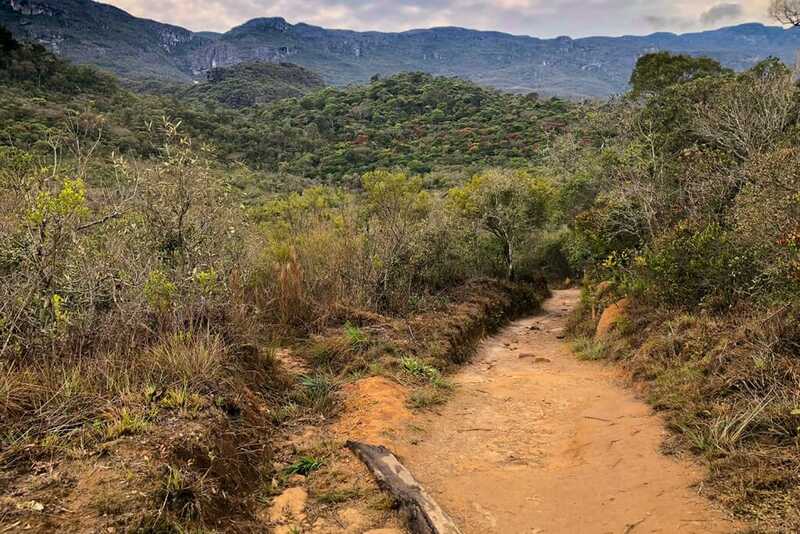 We spend one morning walking the short trails and visited the waterfall, walked Prianha trail to the small river beach and took part of the Bocaina trail where we found a few wolf’s scats and lots of tracks along the sandy path. This is the male’s territory – he comes to the church down this trail every night. The five medium trails vary in length from 3 to 6 km. During the summer months, it is best to take these trails in the morning, before it gets too hot. Yes, the maned wolf is very special. I knew exactly what it looked like, but it still surprised me. It is so big, yet so timid. These wolves and those birds, simply stunning. I had never even heard of the Maned Wolf before, this looks like an incredible experience! Thanks for sharing. Thank you, Odette. Maned wolf certainly needs some more publicity! 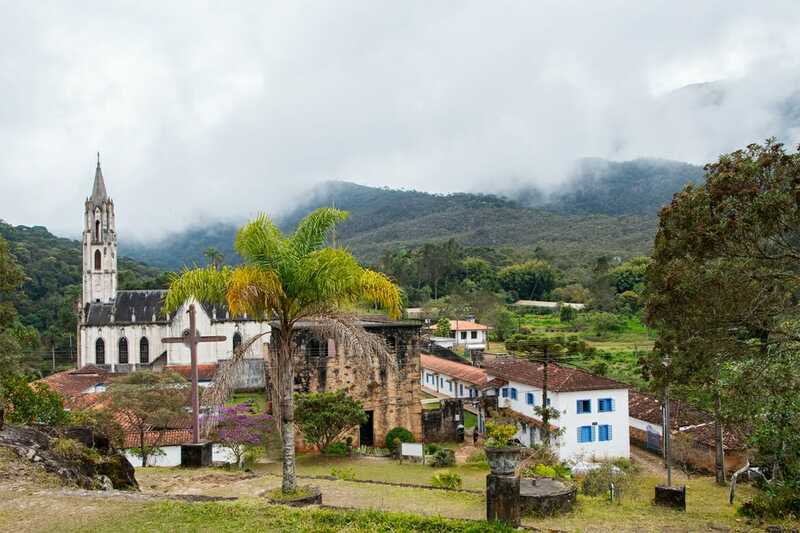 Santuario Do Caraça sounds like such an amazing place to visit!! The maned wolf is so beautiful 😍. The cottage, the buffet and the hikes are so inviting. I’d love to visit. Wowza! What a fantastic experience. I love that you have considered how ethical it is to see the maned wolf, but it does sound like this is an ethical (and amazing) experience! I love the look of the trails, the birds and the crab eating fox too. What a brilliant holiday! Thank you, Josy. Caraca is a very unique place. I could’ve easily stayed there for at least a week.